20 years of Ultra Music Festival and 17 years of A State of Trance came together in Miami last week. Armin van Buuren and ASOT arenas have become a yearly staple on Sunday’s at the March music festival. Trance fans united under the megastructure like they have for numerous years past but this time it was to celebrate a milestone 850 episodes of A State of Trance. The hype around the weekend had been exponentially building for months. Festival goers waited very impatiently for what Ultra had in store but tickets were sold out well before any surprises were announced. Along with the man who started it all, Armin van Buuren, your ASoT lineup was stacked with talent as per usual. Gracing the stage in order of appearance Estiva, Gabriel & Dresden, MaRLo, Andrew Rayel, Paul Oakenfold, Vini Vici, Armin van Buuren with the sunset slot, Eric Prydz making his epic return and the return of Above & Beyond to ASoT as the special surprise guests soundtracked the final day’s festivities. 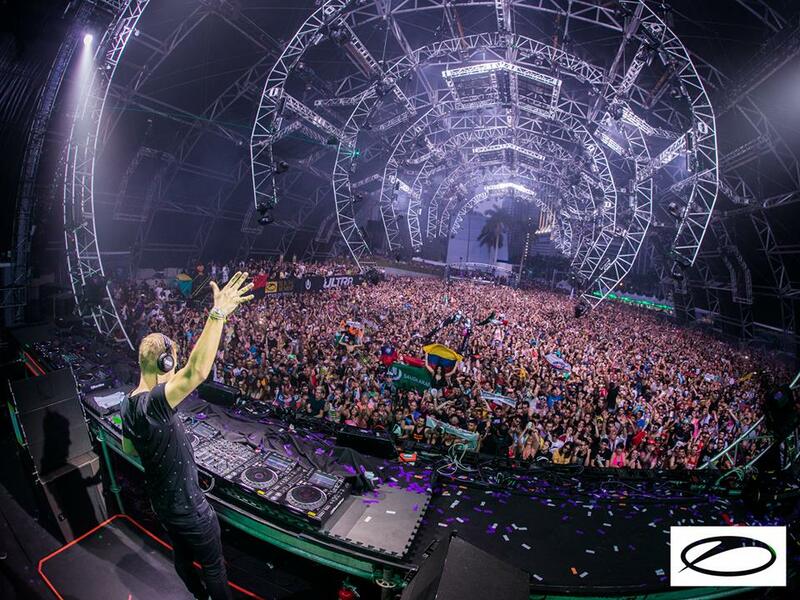 Trance fans were treated to an all day experience that only Ultra could provide. Kicking off the event as the gates opened, Estiva had the duties of getting the music started early, on what was a momentous occasion. Next up was the resurgent duo Gabriel & Dresden. Known for both their undeniable classics and timeless new album tracks, Josh and Dave have always thrived through emotional dance music. A set list comprised of originals, Gabriel & Dresden dropped their vocal track “This Love Kills Me” as well as the hit Cosmic Gate remix of “Only Road,” both featuring Sub Teal. The Anjuna artists went on to play Above & Beyond’s “Northern Soul” ft. Richard Bedford before drifting deeper into their Motorcycle production “As The Rush Comes” which is always a fan favorite to close with. While it was sunny and mild outside, underneath the megastructure, the crazed crowd was prepared for a one of dance music’s god fathers. The legend that is Paul Oakenfold, returning to ASoT at Ultra Music Festival and playing a full on psy-trance set is something that’s special for all music lovers. Paul came out and started the pulse pounding trend with mashups like Underworld’s “Born Slippy” vs “Awake” by Will Atkinson, Vandeta’s “Space Battle” vs Paul Oakenfold “Madagascar” and Space Cat’s “Mechanical Dream” vs Paul Oakenfold “Waterfall” to close. After last year at ASoT Miami, Vini Vici brought everything plus the kitchen sink to this year’s performance. Turning up the bpm in vintage Vini Vici fashion, songs that got attendees jumping were W&W and Vini Vici “Chakra,” the Vini Vici remix of Hilight Tribe “Free Tibet” and the collaborative production “Great Spirit” from Armin van Buuren and Vini Vici. Ready and riled up for the climax of the evening, the moment everyone had been waiting for had finally come in the form of a two hour Armin van Buuren ASoT showcase. Set for a sunset slot, Armin took us all on a journey from light to dark and down the rabbit hole. Complete with loads of new music fresh out of the Armada kitchen, Armin van Buuren made sure to make the night a special one. New tunes debuted in Miami were “The Last Dancer” from Armin van Buuren & Shapov, Armin van Buuren pres. Rising Star ft. Fiora “Just As You Are” and an ID played towards the very end. Along with a few other new tracks premiered at the Ultra Mainstage a couple of days prior, Armin sought out to make a bold statement as we’ve come to expect from him during Miami Music Week. Other highlights were remixes of Armin’s vocal hit “Sunny Days” ft Josh Cumbee, W&W and Ummet Ozcan’s “The Code” and ofcourse Armin’s ASOT 850 anthem “Be In That Moment” in the Allen Watts remix. Getting treated to a two hour festival set is a rare occurrence nowadays, but it wouldn’t feel like A State of Trance without one from Armin inside the trance tent. The perfect blend of trance & progressive artists on one lineup, ASoT Miami bringing on Eric Prydz for the third time in four years sure does please the trance fanatics. Prydz is a widely respected DJ/Producer who has taken to Sunday’s festivities and brought his A game alongside Armin. As per usual, Eric Prydz went dark and dirty in the megastructure. A plethora of IDs, recognizable to the Prydz faithful were mixed in, but only from his live sets as they’re still unreleased. One very distinct track, the classic “Pjanoo” was played at his set’s end to cheers of adoration. More progressive selections came from legendary trio Above & Beyond. The special surprise guests and final act of the night, Jono and Paavo closed out the festival with a euphoric performance. The cult following that these musicians attract, camped out on the guard rails all night to enjoy an up close and personal group therapy session at ASoT. Dance lovers flocked to hear Anjuna favorites from Above & Beyond such as “Always” featuring Zoë Johnston, “Alone Tonight” featuring Richard Bedford and a fitting, acoustic outro of “Sun & Moon” successfully shutting down the weekend. The stage production was top notch, over the course of the weekend it was blatantly evident that the megastructure had received an upgrade. The vortex style structure, enhanced visuals, the lights, lasers and CO2 cannons all made for an unforgettable experience. 850 episodes have come and gone but the memories we share year after year, celebrating at Ultra will continue as long as there is still A State of Trance.